Black Caviar is now in stock! 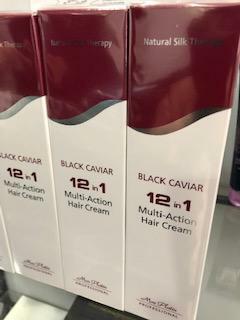 Black Caviar 12 in 1 is truly a remarkable product. Multi-Action Hair Cream An all new, single action formula designed to provide four separate levels of vital benefits to the hair: appearance, treatment, protection, texture. Leaves hair shiny and easy to control for easy, longlasting styling. Adds volume and holding power. Treatment: Repairs and rehabilitates dry and damaged hair. Loosens tangles and mends split ends. Protects hair color and contains UVA and UVB sun filters. Protects against heat. Provides protection before and after various types of hair straightening treatments (Japanese, Brazilian, American, French). Leaves hair feeling silky soft. Makes combing and use of hairdryers and straighteners easier. Gentle fragrance leaves hair lightly perfumed. We now have stock, so pop in and grab yours before they all go.